New Wave Of Electric 2-Wheelers Hits U.S. City Streets As battery technology improves and cities get denser, some West Coast companies are targeting millennial and Gen X consumers by producing cheaper and greener mopeds, scooters and e-bikes. 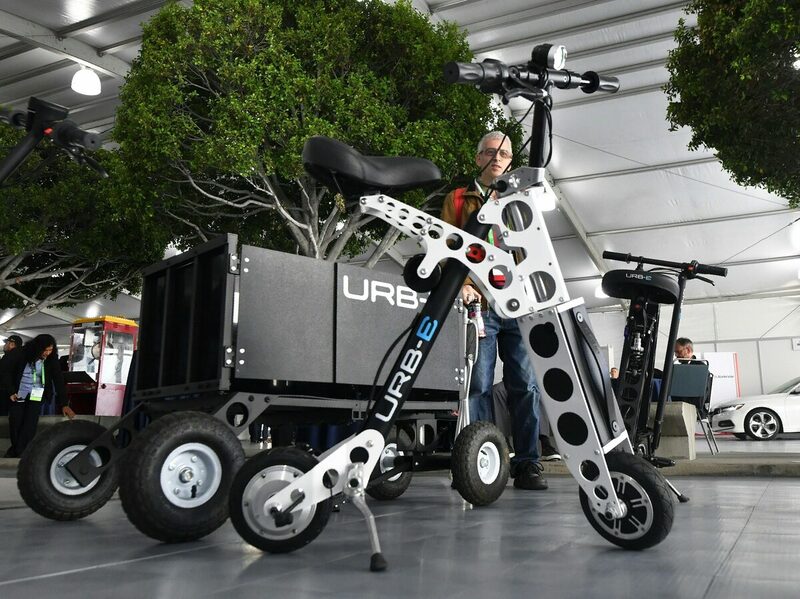 The URB-E electric folding bicycle is displayed Nov. 28 inside the Technology Pavilion at the 2017 LA Auto Show. In the U.S., these smaller vehicles largely have been leisure devices. But as battery technology improves and cities get denser, some startups are seeking to produce cheaper and greener mopeds, scooters and motorized bikes. When John McChesney reported on e-bikes for NPR in 2008, they were pretty much a new thing in the U.S. Electric bikes have a long history but re-emerged after the turn of the century. In that story, McChesney, a baby boomer, pedaled up a hill in San Francisco with the aid of an e-bike. "This is pretty extraordinary," McChesney said, "because I can tell you, on this hill, I would never, ever attempt it, on my own." These bikes aren't just good for hill country — they're helpful to people with injuries or heart conditions who ride on flat terrain, too. And they come in all shapes and sizes, including tricycles and recumbent bikes. The majority of buyers have been 45 or older. Now, though, new startups in Southern California and Oregon are targeting Gen X and millennial consumers looking for something between a bike and a car that's less polluting. These companies hope to create a market for this kind of personalized travel in the U.S., as well as provide zero emissions alternatives to a market that's already popular elsewhere in the world. 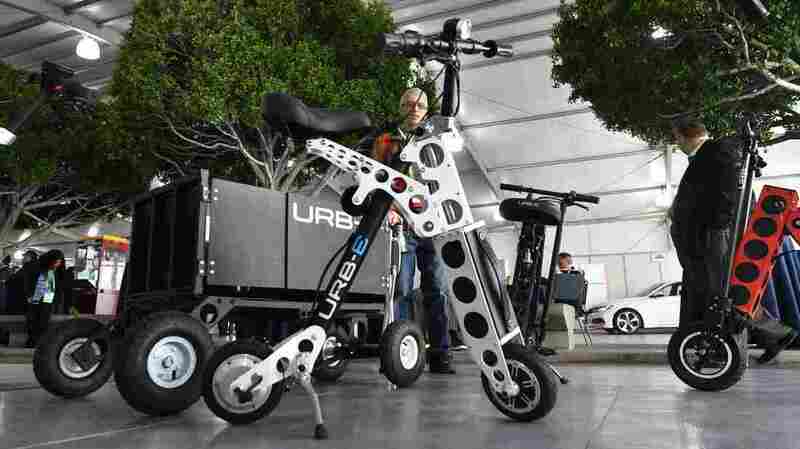 URB-E is a foldable scooter built in downtown Pasadena, Calif. Peter Lee, one of the company's founders, is a millennial, and his scooters are aimed at a younger demographic than the electric bikes. "URB-E stands for urban electric. We exist to solve the pain points of living in cities," Lee says. He says electric cars go a long way toward solving the air problems in a city like Los Angeles, but do nothing about the traffic. "Using a Uber and Lyft is great and very convenient," Lee says, "but using a 3,000-pound car to move a 150-pound, 180-pound body 1 or 2 miles doesn't seem very convenient or efficient to us." Lee isn't trying to replace the car or public transit. The point of these vehicles is what transportation people call the "last mile" — think the trip to the grocery store or from the commuter train station home. As cities around the globe look to ban cars in their central business districts and parking remains a premium, these small vehicles are there to fill in the gaps. "There needs to be a different class of vehicles," says Ryan Rzpecki, CEO of Jump Mobility, an e-bike manufacturer and sharing service. He says that the new devices could be scooters or electric bikes, but that driving around in everyone's own personal vehicle is not the way. As cars become more autonomous and electric, small e-vehicles will make sense to Americans as they rediscover the downtown, says Rzpecki. "Plus they're cooler," he adds. And Jodie Gates with Oregon E-bikes — headquartered in Hood River, Ore. — says electric bikes and other non-car alternatives can help those with limited mobility. She says there isn't as big of a hurdle persuading people to ride: "You don't forget how to ride a bike."